Before we hit the road this past week-end….seriously on the way out the door, I decided I was going to get a card done for the CDS sketch challenge- I have had this set for ages and ages, and thought it would work well with the posted sketch. 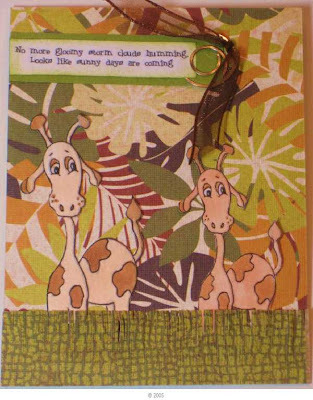 The BG Kraft CS is stamped with a CDS BG stamp with farm sentiments on it in Close to Cocoa. The next layer is Red and it is stamped with the egg from the farm set in White Dye ink. The next layer is distressed by sponging through the mesh onto Kraft CS. 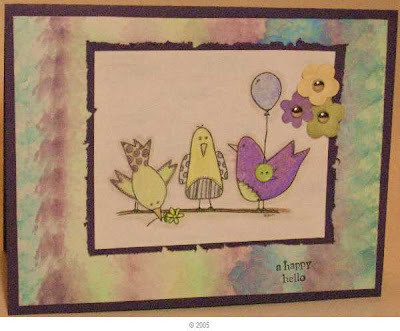 The Chickens are colored with Copic markers, and sponged and distressed with Close to Cocoa ink. The D2D Digi image this week is a Garden Fairy. 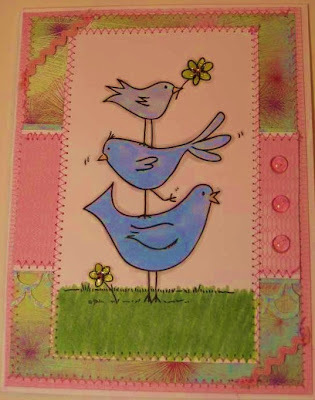 I made a card using the Belli Challenge this week-a clip and a Sketch. I turned the sketch on its side. The image is colored with Copic markers and a Sakura Gel Pen. DP and CS are SU. 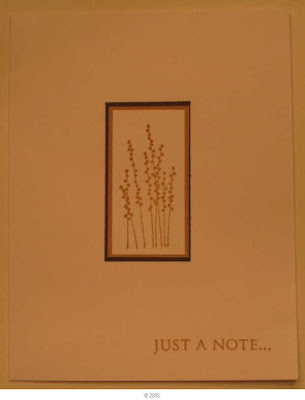 The D2D digi blog gives a free digital image each week if you post a card using last week’s digital image in a card. We are on the road- in Ohio as we dropped off one daughter at Ohio State, and visiting colleges with our youngest daughter. I had the privilege of attending a Copic Certification today- which was wonderful- now I have lots of practice, practice and more practice to do to improve and learn as I color! My instructor Sally Lynn McDonald was awesome and Mega talented. For this week’s Bloggers Challenge we have a Sketch Challenge to follow. 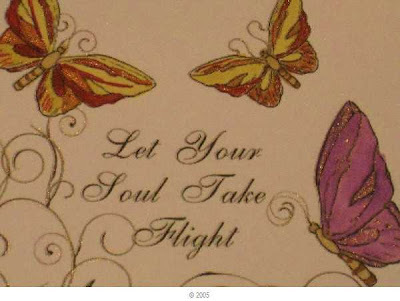 I used a new Digital stamp just released by Firecracker Designs by Pamela . I used a Technique Junkies technique from 2005 called Geometric Overlay- the TJ group has challenged us to revisit this prior technique- and I enjoy the outcome on this card- I will definitely use it again.I printed out the image (twice)- then did the technique on one of the images- and layered the chick and the eggs. Are you on Facebook??? If you are, join the Firecracker Designs by Pamela FB group- now through 3/31 you will recieve a discount in the store.......! 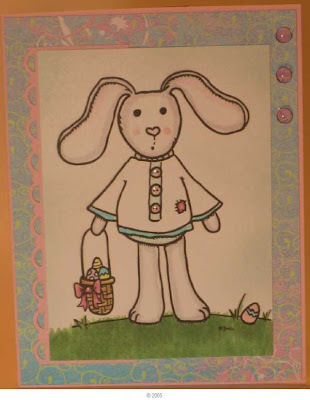 I used all yellow inks- except for the stem- so consider this a monochromatic card- I used a combination of SU inks and Copic markers- plus added some glitz with a Sakura Gel Pen on the eggs. There are two rows of straight stitch sewing around the outer edge of the card- not sure if you can see it in the photo (I used white thread...). 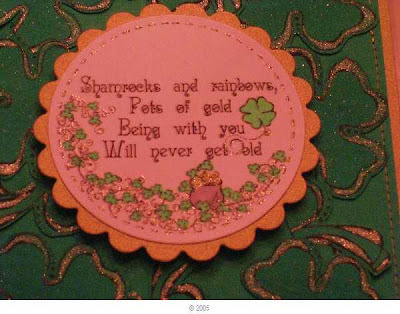 I also want to give a shout out to the Sunflowers and Dragonflies blog- I won the St Patricks Day challenge with my Mono Dies Shamrock card- Thanks so much!!! Be sure to stop by and check out the blog- there are wonderful tips and tutorials offered there regularly! Also- the sponsor of the Technique Challenge I used- to revisit a prior Technique Junkies technique. 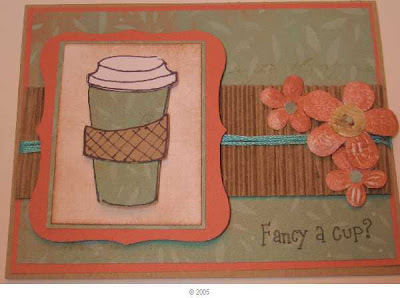 You can see the other Blogger Challenge cards for this week by clicking on the link in my sidebar. 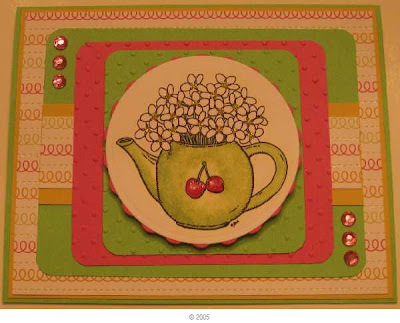 I am in such a floral mood lately- I took a little time tonight to make a card with a digital image from D2D or Designed2Delight. I colored the image with Copic markers and Creative Inspirations Paints. The paint have just been newly released, and they awesome. (They come in over 50 colors, they are water based and a little goes a long way). 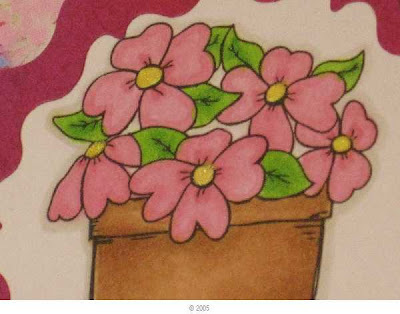 I hope you can see the shimmer- I painted it over the Copic marker coloring in the centers of my flowers. I used Copics W1, E33, E35, YG03, YG17, Y11, R81, R83, R85. I made the card for a friend that entertained us last night. I used Basic Grey 'Euphoria' DP, and Nestabilities to make the frame around the flowers. Dew Drops finish off the card. 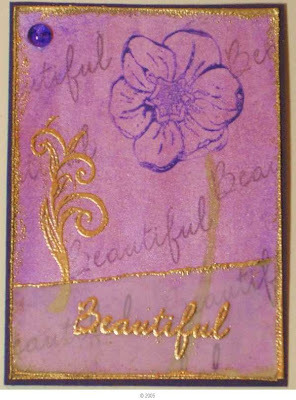 I think that this purple ATC qualifies for Fun with ATC's-Monochromatic challenge, and the 365 sketch challenge for today. I finished up a group of ATC's I made using a Technique Junkies technique called Brayered Brilliance- I tried to take a picture from the side , so the Gold from the BG would show. Initially I made these 'all green' for a themed exchange I was in, but decided for the group exchange, I would add color to the flowers. The exchange is for the Technique Junkies, and we are interested in swapping ATC's to receive different samples of techniques . Thanks for stopping by- hope you were able to stop by the FCD blog hop this weekend- I had alot of fun with the digital sample and embossing on a digital image, and the design team had some incredible samples this time! The outside edge is sewn with Metallic Sulky thread- the vellum is overlaid on Pale Plum CS. The butterflies are painted with Creative Inspirations Paint- it is very shimmery, you can paint over the embossing and it will not stick- so I did not even have to rub it off. The next layer is Gold Metallic CS, then distressed edge Pale Plum and Plum. The ribbon is 5/8" Metallic Gold. Here is a close up of the same image printed on Georgia Pacific White CS. I colored the butterflies with Copic Markers and highlighted parts of the butterflies with Shimmerz (FCD carries this-here is the link ). I highlighted the flourishes with the Sakura Gel Pen. CS used- Barely Banana, Pale Plum and Perfect Plum . 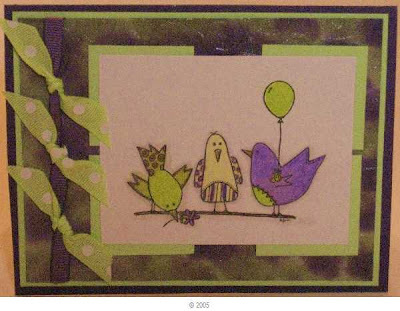 I was stamping and had a Green themed ATC to make, and decided to finish this card I have had sitting on my desk...... These are digital images available at Firecracker Designs by Pamela. I printed out the 'giroid' twice and made one just a pinch smaller than the other....I love the sentiment- cheer up! Sunny skies always make me feel a bit happier in general........ although I hear we may have snow here on Saturday...!!! Happy St Patrick's Day-Digitally Done! I used some new St Patty's Day Digital Images from Firecracker Designs by Pamela- Here is the link-I combined two of the images and used a technique called Mono Dies from the Technique Junkies. The CS is SU- Glorious Green and Metallic Gold. I colored the image in Copics and a Sakura gel pen- Ohhhhh- love the sparkle. I outlined the edges of the shamrocks with the Sakura Gel pen. 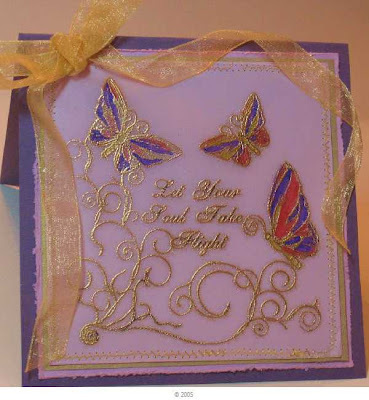 I added a row of Gold metallic stitching around the outside of the card- love sewing on cards. 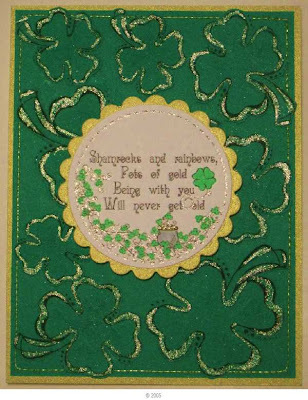 I love the sentiment on this card- I made it for my husband-he will enjoy it even if he is not Irish! Pollycraft-Sparkley things- Oh yes- this is sparkley!!! Digital Tuesday-Saint Patrick/lots of green- Oh Ya!!! My ancestors are from Gorey, Co Wexford, Co Mayo, and Tipperary. A huge thanks to my Blogging friend Loretta who sent me this awesome post it note holder. Thanks Loretta!!! I love it and really appreciate your time and trouble! 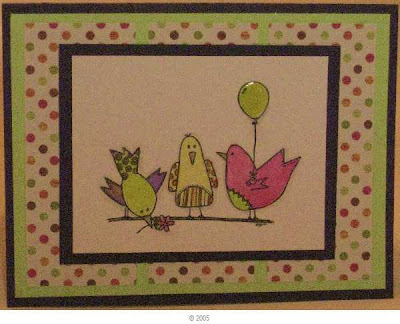 I always start out simple, and end up adding more.......This is a D2D digital image for an ongoing posting- the images are free week one, if you post a card you get the next week's digital image free- I have become addicted to the challenge- the images are always so cute done up on the cards! If you jump in mid-month, purchase the digi and post an image, and you will get the next one free. Refer a freind and you get a free image- one a month limit- if you jump in- please mention my name! The image is colored with Copic markers YG03, G21, G24, B21, B23, Y11, Y13, E11, C2 . It looks a little brighter here -could not get the accurate blues in this picture....... DSP is Basic Grey and CS SU and Georgia Pacific. The flowers have crystal effects over the Copic coloring. 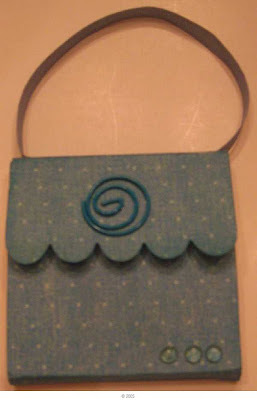 Please stop back later this week- Firecracker Designs is having a blog hop! We are featuring FCD Digital images- which Pamela has just added to her store- LOVE them!!! Pamela is also offering some Digital FREEBIES- enjoy! Bloggers Challenge happy Birthday + I won more candy!!! I finally had time to create today- Yeah! I am such in a floral mood lately- and I also got a chance to play with some new paints made by Creative Inspirations. Today is our Bloggers Challenge "Mom's" Birthday celebration- Happy Birthday Lisa! 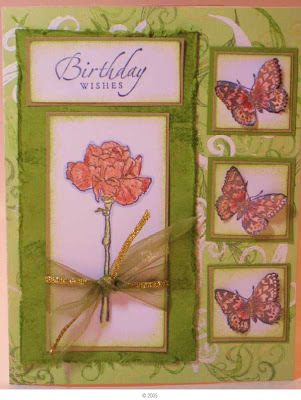 It is also a Birthday at Gingersnap, where they asked for Frosting on your card- I frosted my butterflies with a 2nd layer and CI paints-link below. 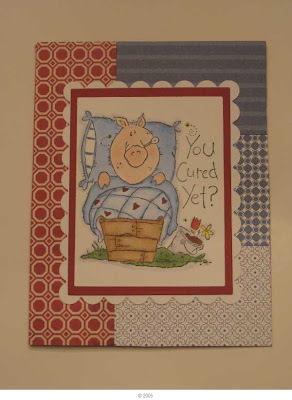 I used a new Sketch challenge put out by Pamela at FCD- love the way it worked out! 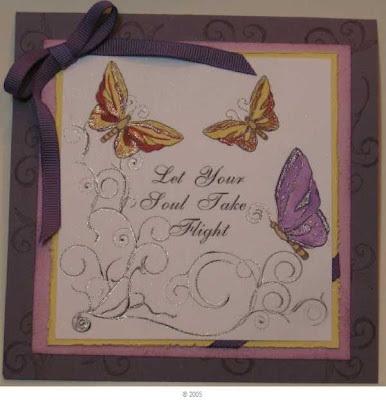 I stamped the butterfly 6 times and cut out three of them, attached just the center section so they are dimensional. The BG is called Brayered Brilliance from the latest Technique Junkies newsletter- all in SU greens and Brilliance Gold inks. 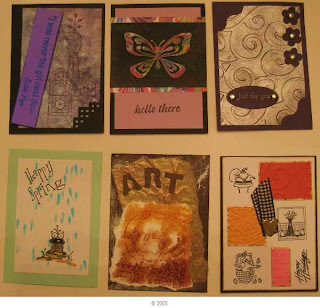 Stamps are Firecracker Designs by Pamela (Sitting Pretty, Butter/Dragon Fly, and the ATC set 2009) and SU sentiment. 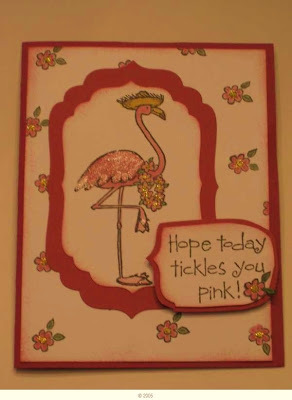 I used a new paint by Creative Inspirations- they are wonderfully shimmery- I painted them on, but you can use them in many ways- dabbed on, add to water in a mister and mist it on- use like Radiant Pearls or any Mica product to get shimmer on your card. 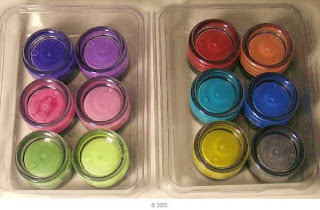 I will be storing them in small clam shell boxes where I can very easily visualize the colors. 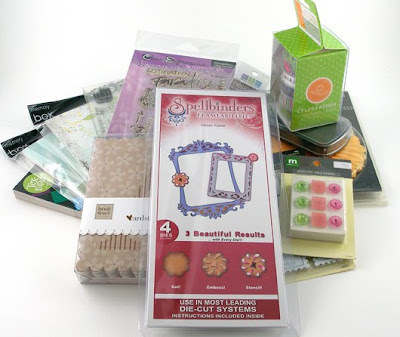 I also wanted to mention a HUGE THANKS to Becca for her recent Blog Candy that I won! I have been very blessed with winnings lately- I keep hearing-"go buy a lottery ticket"!!! 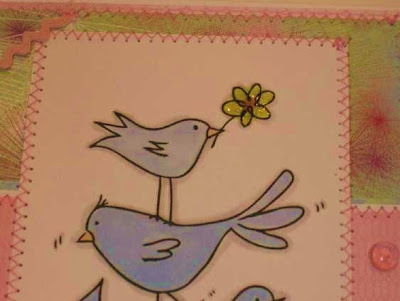 Last week, I also posted cards from all of my blogging sisters, plus one I sent to Joanne, and I won the prize at Saturday Spotlight with Hidden Potential- 4 digital images from In Style Stamps. 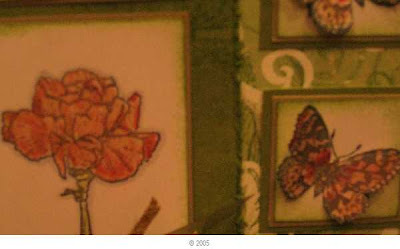 Thanks to Saturday Spotlight and In Style stamps- I have not picked my images yet. Thanks for stopping by! You can view more Bloggers Challenge cards by clicking on the icon on my sidebar. We had dinner for family last night- we had 2 of my sisters and one of my (4) brothers for dinner- plus spouses....after everyone left, did the dishes and watched the end of the Oscars...then remembered the Blog Candy- sorry- winner is #5- Joanne!!! I'll get the stamps in the mail! I have been invited to be on a new Design Team for a new sparkly paint- Creative Inspirations. 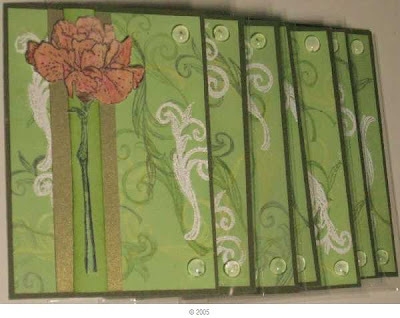 I am very excited and feel this paint will work beautifully with my DT cards created with Firecracker Designs by Pamela stamps and my Technique Junkies techniques. I will add the other DT members blogs to my sidebar as soon as I can get the sidebar to behave and move the DT logo where it belongs!!! I started this card with the idea to try a Zindorfian techinique and get out my brayer, so I printed it on SU Whisper White CS. I was surprised the Copics did pretty well on this paper- not the usual 1st choice as it is coated. I did end up sponging Soft Sky and a touch of Baja Blue on the edges of the paper, I added a strip of Pink Pirouette scallop punched and backed the image onto Basic Grey DSP layered on Pink Pirouette CS. I LOVE pinks and blues....... I added pink Dew drops with Crystal effects, and decided to add crystal effects over the buttons while I was at it. 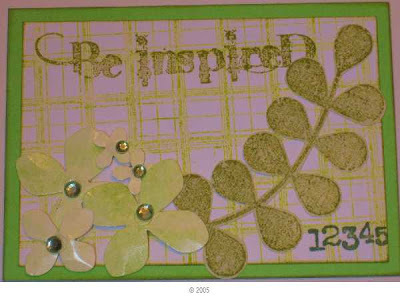 I have some GREEN on my desk too- have you seen the new Irish digi images at Firecracker Designs by Pamela??? Go check them out- it is hard to find really nice Irish images- and these are really nice! I am having a birthday dinner tomorrow with my two sisters and one of my brothers-all three have birthdays in the week before and after this one..... so need to work on ....what to make for dinner! BLOG CANDY is at this post- please drop by-ends Sunday night. The Technique Junkies ATC swap- I sent in 9 ATC's and received 9 back. I am in a few blogging groups- my mailman has been busy!!! I need to get busy and get some more cards posted!!! (And I need to get some made and mailed out........)!!! Thanks Lynn! I think CAS is so hard- Love this!!! I hope you do not mind if I CASE this! 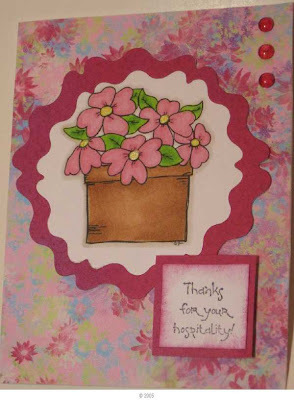 Next is a card made by Kathy, who is my blogging sis and also plays along with the D2D challenges for digi images- Thanks for the Magnolia images- I am working on learning to improve my Copic skills with these delightful images! Piecing, so LOVE the sample in hand to visualize- and thanks for the House Mouse images! I highly recommend joining Blogging groups! I have met the most amazing ladies!!! I have a desire to try coloring the Magnolia images with Copics- so my friends shared some with me. And- I was accepted into a Copic Certification class- I am very excited, as I scheduled it so I can also visit my daughter at Ohio State the same weekend, and stop by Marco Papers.........! Yippee!!! Oh My Goodness- the Saturday Spotlight challenge is -Girlfriends- I think this post qualifies!!! Wahoo!!! I have some exciting NEW news to share......tomorrow! I have been out shopping for a new computer- pardon my lack of card making and posting. I have some blog candy to post- please leave a comment and tell me what St Patrick's day tradition you most enjoy! 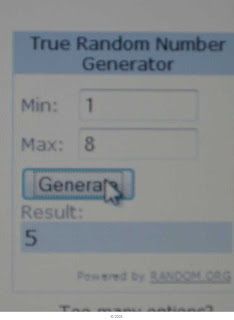 Winner will be chosen and posted Sunday at 7PM - you will have 24 hours to reply to claim your goodies! Cured Yet Nancy??? I Hope so! 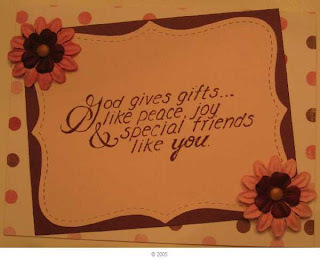 I have a couple of friends that I have needed to make Get Well cards for- and I just do not have the right stamps! Being that I am a nurse- that is pretty bad! Well, this weekend I finally connected with a wonderful stamper I met in the Trade forum here on SCS -in person in Kentucky- and I traded for this great set I have wanted for a long time- isn't this a great Get well image??? I played along with the Sketch challenge at SCS for the first time in ages. I simply colored with Copics and used SU DSP for the Sketch. I know I will get alot of use from this set- I made two of these cards. This Clean and Simple card qualifies for the Saturday Spotlight with Hidden Potential challenge. 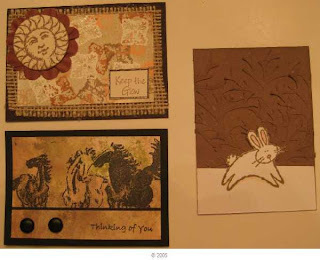 I have been having computer issues- so a quick upload of three cards I made with the D2D image this week. First though, let me tell you that this week- posting tomorrow- is the FREE image at D2D (aka Designed 2 Delight ) if you have any desire to play along- it is a great time to jump in- you get another free image each week you make a card with the image and get it posted by the deadline......which is fast approaching....!!! Oh- for my Stamps R Us challenge this month, we are to use distressing on our cards, so I distressed the edge of the purple border. Colored with Prismacolor pencils and Gamsol, background is polished stone- yep- done in stripes! This one is also done with Prismacolor Pencils and Gamsol, mounted on a BG of Dabbed Shimmers- a Technique Junkies background- it was then put through the Cuttlebug. I have alot of pictures to take and upload this week- sharing a computer to have to sign off now.